HomeSimon BloomSimon Bloom, the Gravity Keeper: Now in Stores! Simon Bloom, the Gravity Keeper: Now in Stores! Ordinary sixth-grader Simon Bloom has just made the biggest discovery since gravity – and it literally fell into his lap, or onto his head anyway. Simon has found the Teacher’s Edition of Physics, a magical reference book containing the very formulas that control the laws that govern the universe! By reciting the formulas out loud, he’s able to do the impossible – like reverse the force of gravity to float weightlessly and reduce friction to glide on air! But a book this powerful isn’t safe with Simon for long. Before he knows it, evil forces bent on gaining control of the formulas are pursuing him. And theyll do anything to retrieve the book. Now, Simon and his friends must use their wits and the magic of science in a galactic battle for the book and the future of the universe. 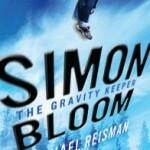 Simon Bloom, the Gravity Keeper, a funny, fast-paced science fiction adventure by first-time author Michael Reisman is now on sale in bookstores everywhere. Click here for more information as well as standards-based lessons and activities, a classroom discussion guide and a guide to the Knowledge Union.